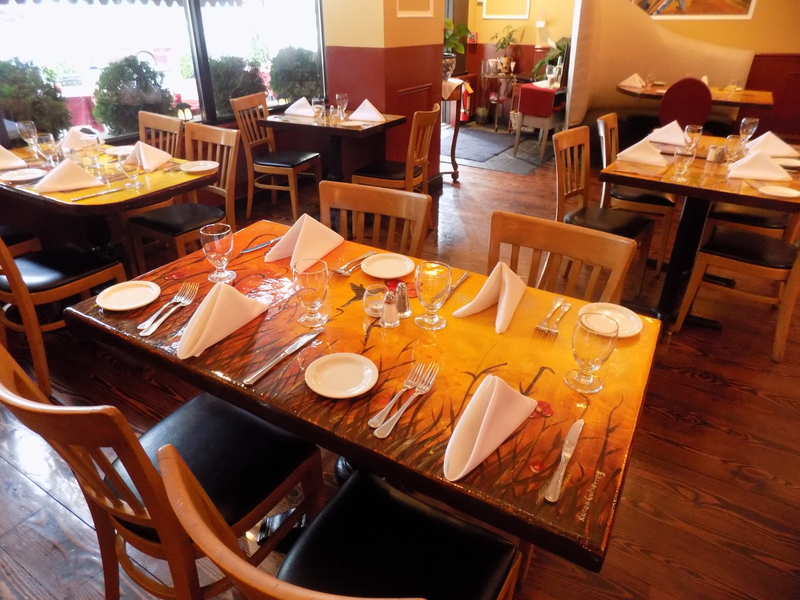 Terra Rustica Due :A Great New Italian Restaurant In Mt KiscoTo Try! I recently visited Terra Rustica Due, located in Mount Kisco, New York. 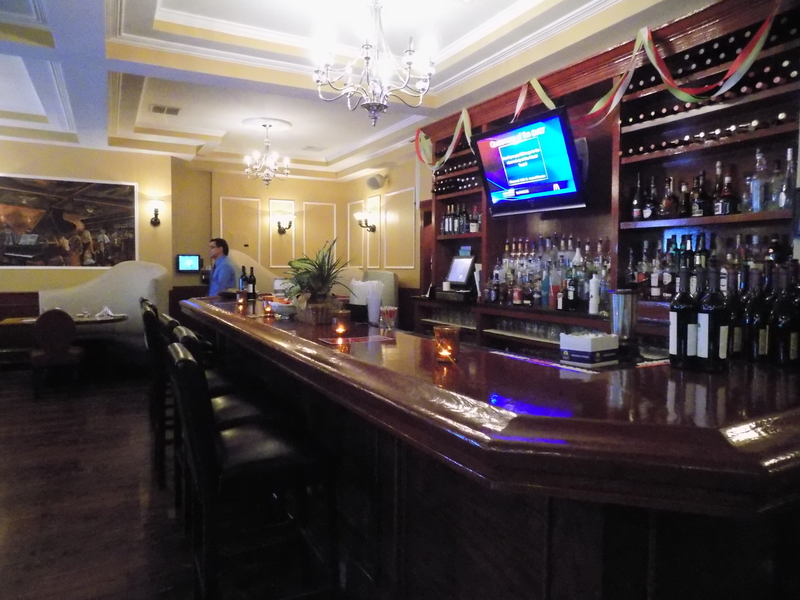 This is a new Italian Restaurant with the same owners as Terra Rustica, located in Briarcliff Manor. 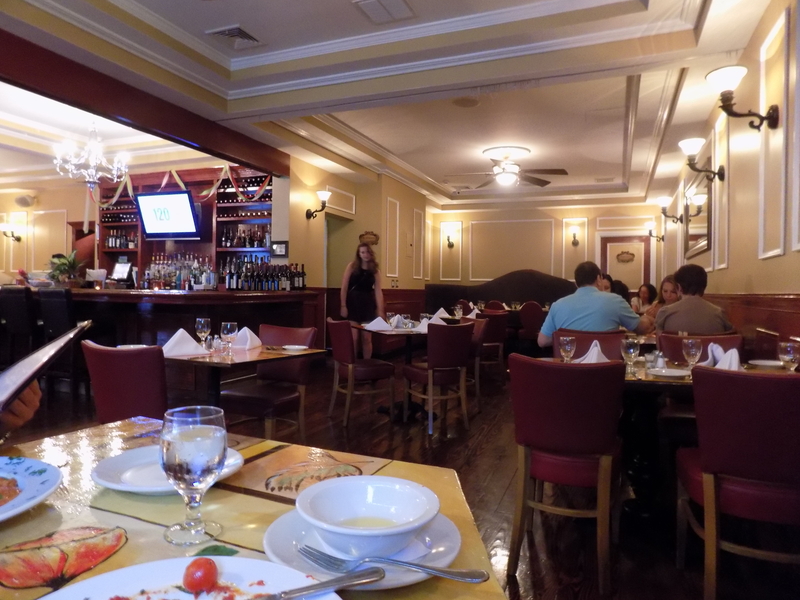 Although I have never been to the Briarcliff Manor location, I thoroughly enjoyed Terra Rustica Due. This is a fantastic new restaurant for Italian-food-lovers to try! Upon walking in the restaurant, I noticed the classic molding with curved settees and hand painted tables, not to mention a dark wooded bar. As a seafood fan, I was pleased with the multitude of fresh seafood dishes available on the menu, from Tilapia Con Puree Di Broccoli to Seafood Pasta. I was told by the manager that all the seafood served is “extremely fresh”. If seafood isn’t your favorite, there are plenty of other dishes available on the menu. Terra Rustica Due prides themselves with their homemade pasta. There is a variety of pasta dishes available on the menu to try! In addition there were several innovative salad dishes on the menu, each with a unique assortment. The Insalata Di Crescione was served beautifully in a parmesan cheese basket. For our meal we began with a family size dish of Rollatini Di Melezane. 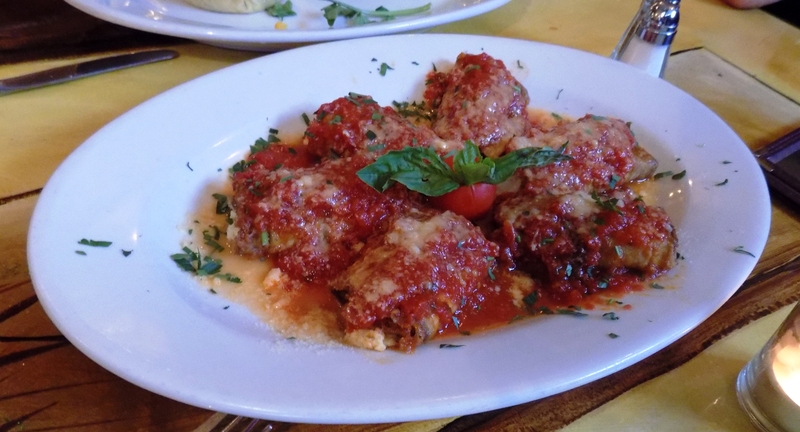 This eggplant rollatini was baked in the restaurants pizza oven, allowing for a heavenly taste. As another appetizer we ordered two salads, Insalata Di Crescione and Insalata Di Frissee. 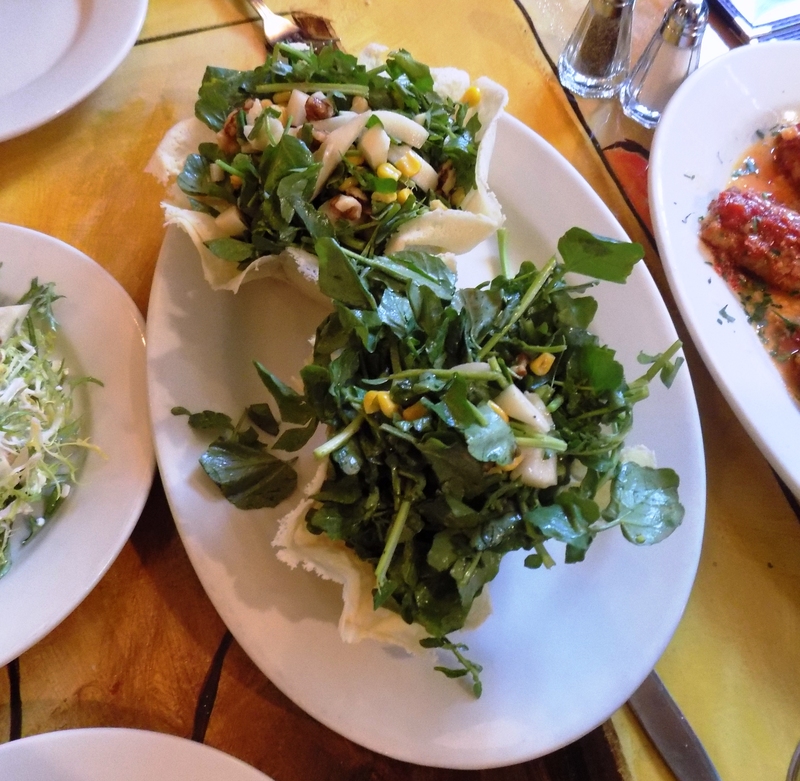 The Insalata Di Crescione was gorgeously presented in a parmesan cheese basket with watercress, roasted walnuts, corn, pears and gorgonzola inside the basket. The Insalata Di Frissee was a scrumptious salad accompanied with apples, roasted pecans, goat cheese and cherry vinaigrette dressing. This is a fresh light tasting salad, perfect for the summer months. 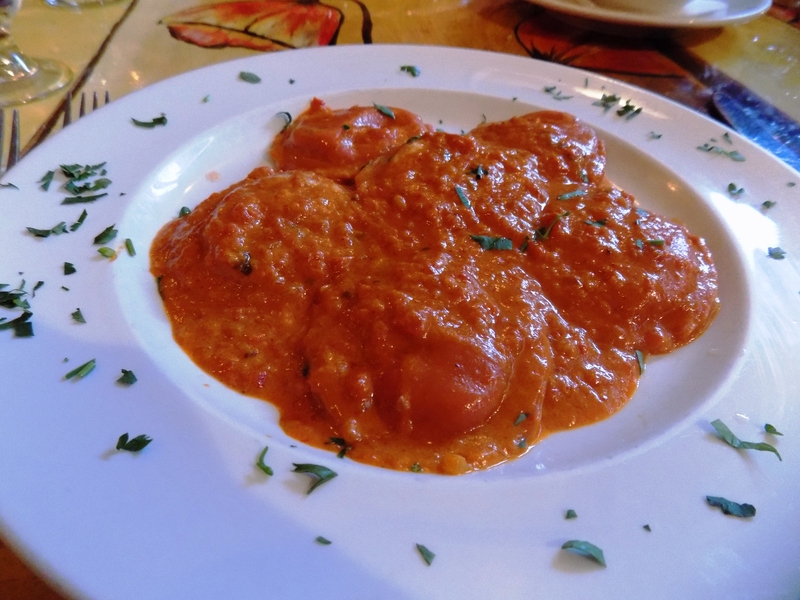 My husband had Lobster Ravioli in a pink cream sauce for the entrée. 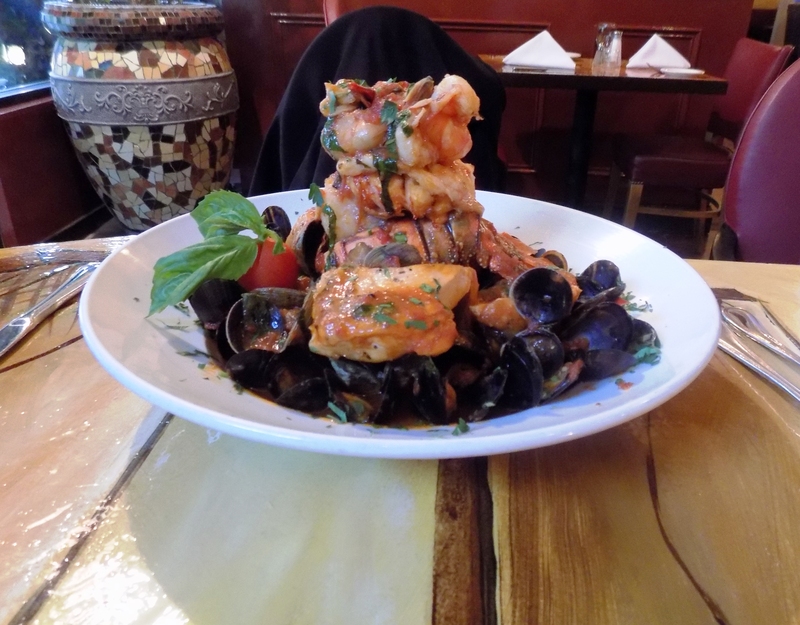 I enjoyed the Zuppa Di Pesce, this beautifully presented entrée consisted of clams, mussels, calamari, scallops, and shrimp in a light marinara sauce. My daughter ordered the Petto Di Pollo Con Scamorza. This chicken dish is comprised of diced zucchini, portabella mushrooms and topped with fontina cheese, in a white wine roasted chicken sauce, served with mixed vegetables and mashed potatoes. As a side we enjoyed Penna Alla Sisina. This wonderful penne pasta was accompanied with fresh tomato sauce with diced eggplant and fresh mozzarella cheese. Although we were quite full, we could not miss out on dessert! To complete our dinner, we had flan, a nice way to finish a great meal. located in New Paltz New York set within the pristine natural environment atop the Shawnagunk Mountains. 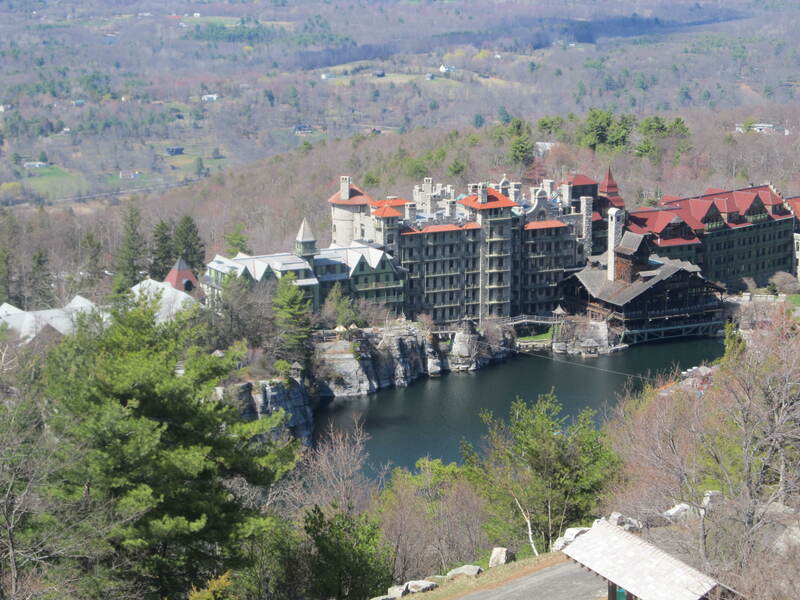 Set on the edge of Lake Mohonk, this is truly a wonderful place to enjoy a day of hiking while experiencing a beautiful Victorian era hotel and its many amenities. It is listed as a National historic landmark and is an amazing structure with a 30,000 square foot award winning spa listed as the number one resort spa in the United States by Conde Nast Traveler. There is fine dining,tennis, golf, lake swimming,and boating for overnight guests as well as a fitness center, carriage rides , kids programs, covered ice skating rink (in season) and an indoor heated pool.There are beautiful formal gardens which are in bloom well into autumn. I visited this resort for a day visit and had a great time hiking and walking the grounds and visiting the inn. 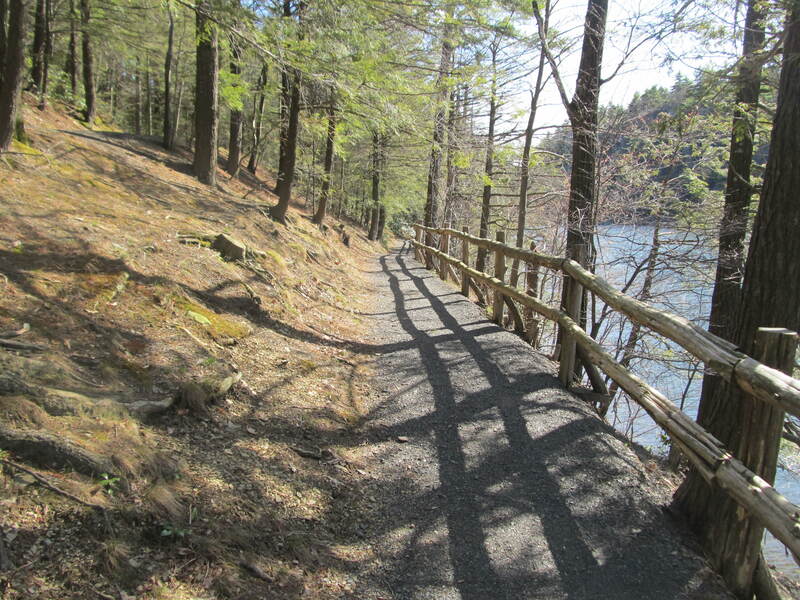 There are numerous hiking trails throughout the property of various levels of difficulty. 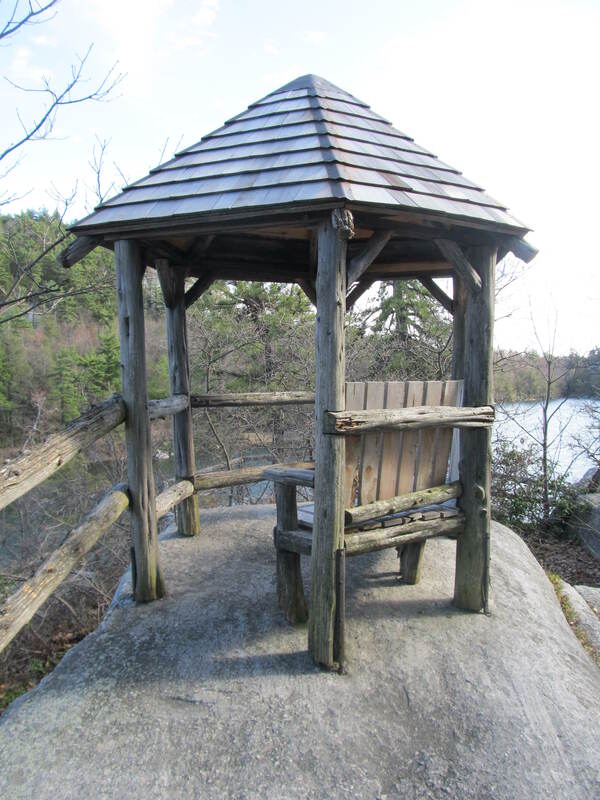 The trails on the hotel property also connect with the trail network in the Mohonk Preserve and to Lake Minnewaska State Park. The Smiley family which founded Mohonk and still operates the hotel to this day embraces the the natural surroundings of Mohonk and are stewards of its beauty. Each of its carefully planned trails brings the hiker to a new vista or interesting natural feature. On one of our hikes we left the hotel and walked along the side of beautiful Lake Mohonk, skirting along its shore to the south end. We circled back along the base of the cliffs and then up along the cliff top back to the house. An easy walk of an hour or less. Along the way, your view of the lake and the mountain keeps changing and provides plenty of photo opportunities. If your feet are tired you can rest at one of the many Summer houses along the paths. 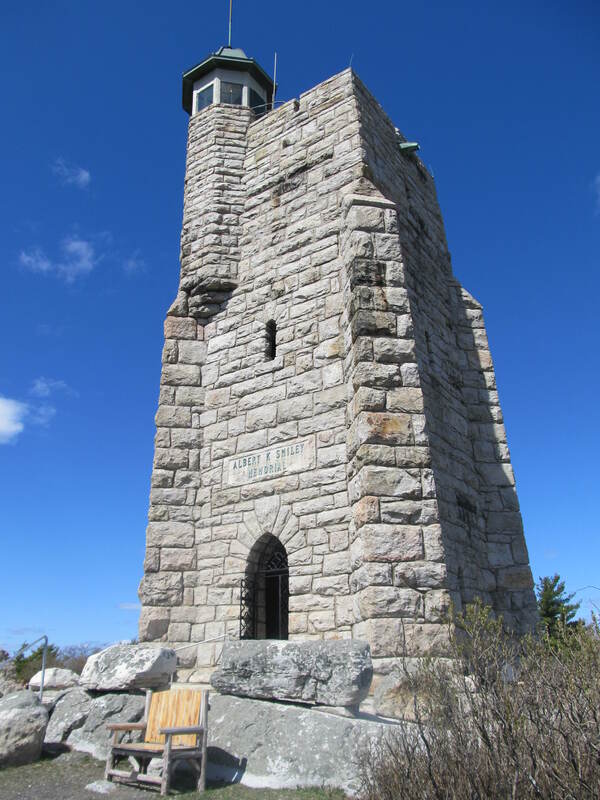 A second hike and more strenuous is the ascent from the lake to the top of Sky Top and the Alfred Smiley Memorial tower. The stone tower is open and you can climb its many steps for an amazing 360 degree view. Bring a pair of binoculars. One of the most challenging trails is the rocky scramble through the Labyrinth which will challenge you with its steep vertical climb. There are many trails through the property and beyond which is one reason to keep coming back to this special place and explore its wonders. There are 259 guest rooms many with balconies and fireplaces. All overnight guests receive three meals a day in the inn included with their hotel rate as well as afternoon tea and cookies.This resort has to be seen to truly experience and capture the beauty all around . The woodwork and staircases alone will impress you and shopping is available in the quaint and well stocked hotel gift shop. 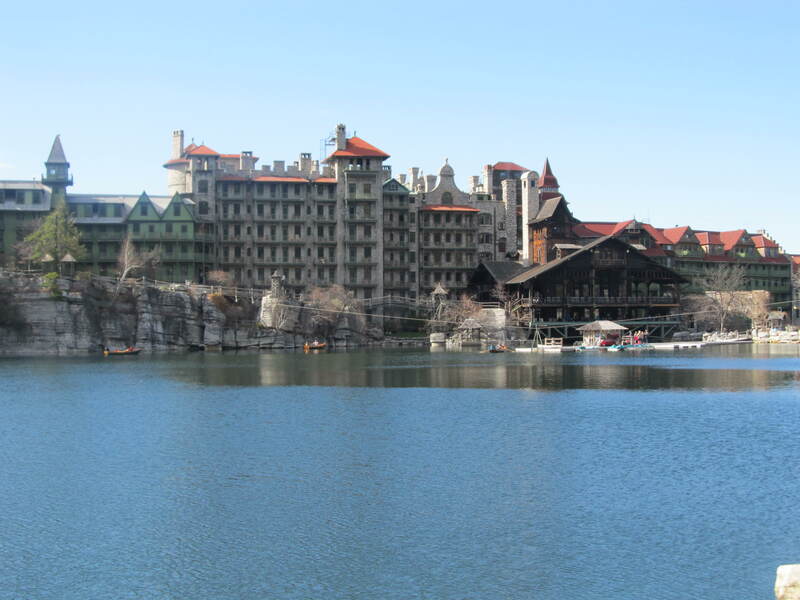 Mohonk Mountain House is also a great place for a family reunion, romantic weekend getaway or to spend time with the little ones. The hotel also hosts wellness events and meditation retreats and it is easy to see one meditating in such a serene environment. I will be making a reservation for the fall as this is a great time to visit and see the leaves change and beautiful scenery. Check out the resort website for special events and happenings in the area. 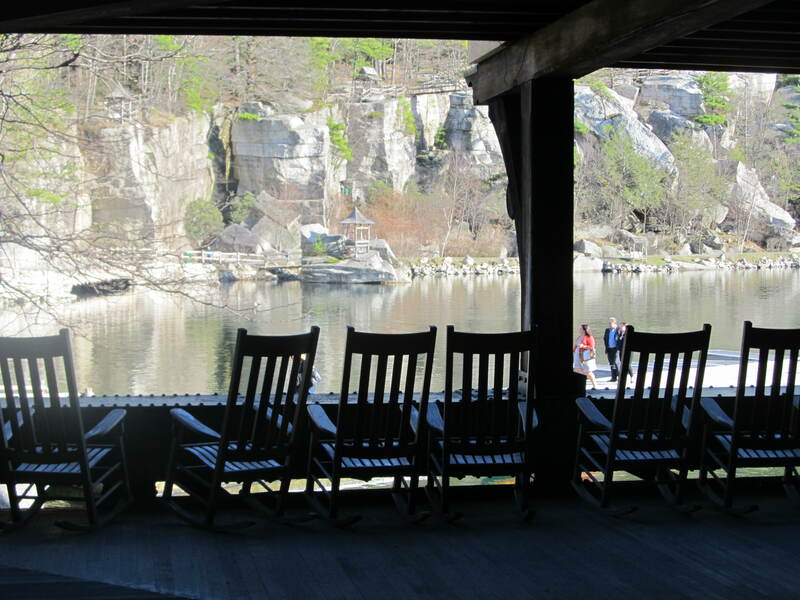 New Paltz is a great town and Mohonk Mountain House is a unique and beautiful place not to be missed.